I have tried making Chapatis many times. I can make dough for Chapati very well, but I am failing when it comes to structure of the roti/chapati. When I try to flatten it, one side (when you look at it horizontally) is thicker than the other which makes it hard to be cooked evenly and results in a chapati that no one wants to eat. Chapati should be round, sometimes I am lucky, most of the times it is similar to map of Australia. Is there a trick to keeping the chapati all uniformly round? If you are having trouble rolling dough to a uniform thickness then you might consider putting training wheels on your rolling pin until you get more practiced. 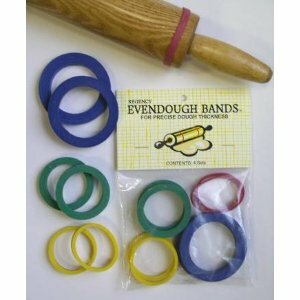 These rubber bands fit on your rolling pin and act as spacers so you can enforce a strict thickness upon your dough. They are, of course, useful for rolling out many things besides chapati. To reiterate what @rumtscho and @bob said. Your dough should be of a uniform consistency if you want to roll it out in a uniform manner. As far as a perfect circle goes, turn it often and don't roll too much in one direction. It just takes some practice. Roll the dough into rough balls, and allow it 10 minutes to rest so the gluten can relax. Flour both the work surface and the dough THOROUGHLY. Flour is your lubricant here, and you can never have too much lubricant. I like to plop it into a bowl of flour regularly during the shaping. Start by flattening the ball with your palms to get it started. This helps get the initial shape right. Keep flouring & flipping the chapati as you flatten it, so it doesn't stick to the work surface or rolling pin. You can NEVER have too much flour! Traditionally a raised, round platform is used in shaping. You may find this YouTube Video useful for how to shape chapatis. Knead you dough nice and soft and even. Make smalls rolls of the dough for each chapati and leave them for over 5 minutes. Flatten the chapati rolls between your palms. Place a circular cut cloth of equal size on your rolling plate. Now place chapati dough at the center of the circular on the rolling plate. The cloth ensures that your chapati does not stick to the rolling plate and you can keep turning the chapati easily and frequently so that it is rolled out evenly. The circular cloth will help you in making exact round chapatis. Indian rolling pins are thicker at the centre, and taper towards the end. This helps to spread the dough into a more circular circle. Take a chunk of the chapatti dough, roll it lightly to form a ball, and flatten it slightly between your palms. Dip in flour, place on a floured surface, and roll it flat with a rolling pin, rotating it a couple of times to ensure even thickness. You sometimes see people flapping the chapatti from hand to hand, but they've had years of practice; life's too short, use a rolling pin! The trick to rolling round chapattis of uniform thickness is to first start rolling the edges. Start with say the right most edge. The pin should roll back and front and at the same time should turn a bit so the chapatti turns without you having to turn it. That way eventually all the edges will come near the right side of your pin and be rolled and rotate out. Imagine driving a car, you dont turn the handle at 90 degrees to turn, you slowly turn. While learning, you dont know how much turn to apply but with practice you apply just enough turn to the steering without the car jerking too much. The turn is smooth. If you are learning to drive someone taking 2 hours a day over 4 days will be better than someone who has taken 8 hours today just because muscles take time to develop a memory. Give it a weeks practice and you should get it right by 7th or 8th day. Not the answer you're looking for? Browse other questions tagged indian-cuisine flatbread or ask your own question. How to evenly portion chapati dough? How do you make 'Rabri'?